World Choir Games 2020: special attention for Françoise's Inhaling Singing technique. Read the Choir Games director review. Article in "NINA": Françoise's TED talk about the continuous development of the human voice. View artcile. 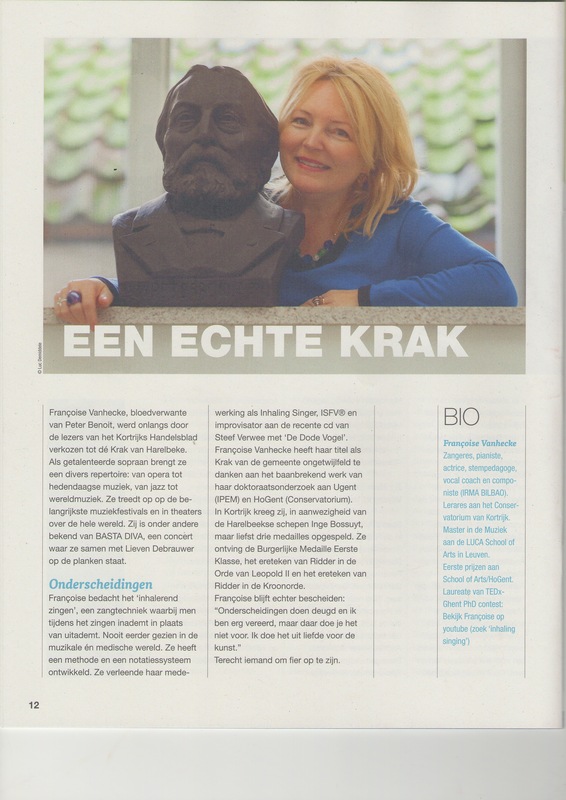 Article on inhaling singing in "Physics in Medicine"
Interview with Françoise Vanhecke on her ISFV technique in the local newspaper "Krant van West-Vlaanderen". Click here to read the article. Françoise Vanhecke and Duo Phoenix. The Logos Women (Françoise Vanhecke and Moniek Darge). Françoise Vanhecke, pioneer of inhaling singing (Wikipedia). Françoise Vanhecke, speaker at TEDx. Oorgetuige: Françoise Vanhecke gives lecture recital on new singing technique.